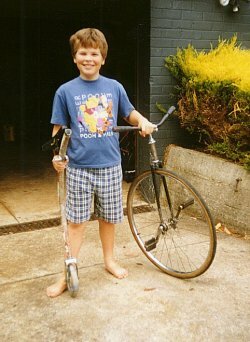 The aim of this project was to build a High-wheeler for my 8 year old son out of existing bike parts I have collected. 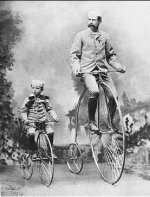 To this end it varies to some degree from the original Penny Farthings in equipment, especially when using the normal bike tubed tyres. These are much more difficult to size than normal bikes because one straddles the big wheel so I'm sure my son will grow out of it quickly. 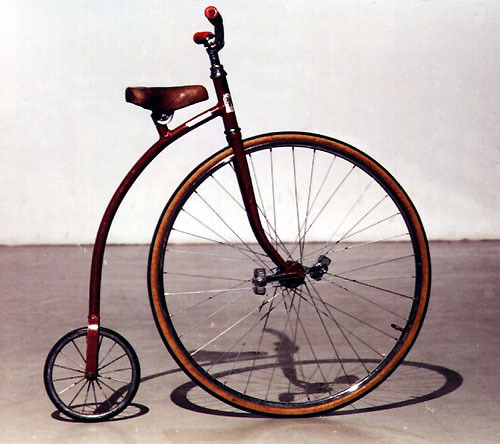 Looking at other Penny Farthings it seems that the front wheel is roughly 3 times bigger than the rear. My original intention was to use an 8" ex wheelchair front wheel on the rear as I thought it was a better proportion but the one I had was too hard to buy tubes and tyres for so I opted for the normal 12" bike wheel. 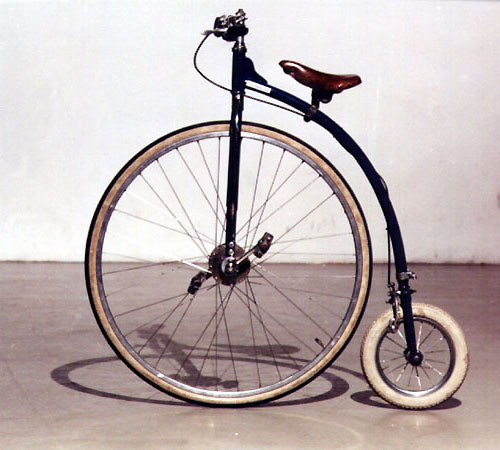 The main tube on most Penny Farthings follow the front wheel for about 90 degrees and so therefore have a relatively short wheel base. I'm not sure why really but I decided to extend the wheel base just a little, maybe in the hope it will make it tip over forwards less easily. They also have a steering lock for, I believe, to stop the big wheel burning you legs if you turn too sharp. I didn't think it necessary in this case. Many of the handlebars are bent into the M shape (more like the McDonalds logo really) to accommodate the rising knees of the rider. I'll need to go this way too as Chris gets taller. It looks to me like most Penny Farthings have just one brake, placed on the front and usually the spoon type that press down onto the hard rubber tyre. I'm not convinced this is a good idea, especially on a child's version so I skipped the front brake and placed one on the rear. 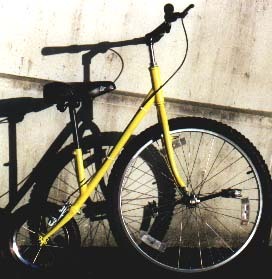 The rider can resist forward motion just by forcing back on the pedals. These could/can easily tip over forwards and so I figure this is as much braking on the front as what's needed. 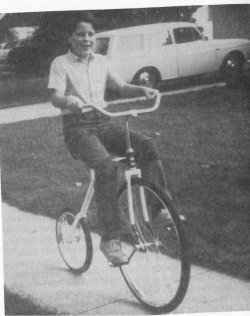 The brakes were easy to mount when using normal bike 12" front forks but I ended up using centre pull callipers to give less obstruction. The normal callipers placed the brake cable out where it could be caught by the rider and didn't look as neat. 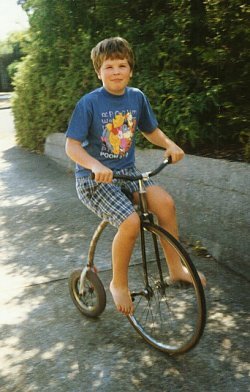 To be honest I haven't had much of a look at existing Penny Farthings first hand but in all the pictures I could get a hold of they all seemed to have straight front forks. This was easily achieved using normal bike forks by placing them in a home-built press whilst propping up both ends. I expected it to be much more difficult and was particularly concerned it would kink the tubing but there was no problems at all and it was done in a minute. The dropout is simply cut off ready for the home-built bearing mount to slide up into it. The bearing mount we made by cutting a piece of tubing the same dia and width as the sealed bearing to which the fork will be welded to. 2 small lugs were welded to the tube then split to make a clamp. Because the wheel needs to be removed from time to time (EG. changing tyre) this bracket needs to be removable. 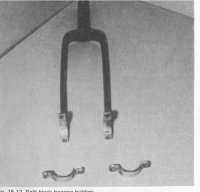 This was achieved by welding a bolt onto the clamp, brazing 4 nuts onto the forks so the assembly shown in the drawing slides up into, and is fixed to the forks. 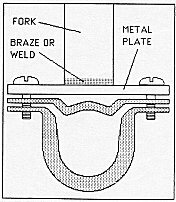 Weld on a long nut each side of the tube or alternatively use a small tube and weld a nut at the end. Split both sides with a metal saw to make the clamp gap. If using the long nut, drill out the thread on one side. This is how it should end up to be. This is the most difficult part of the machine to manufacture. The pedals are fixed to the hub (no freewheel) - very different to a normal bike where the same area has bearing races. I'm lucky to have a friend that has a lathe and was interested in the project so all of this was made by him - great!! We had 2 goes at this before we came up with one we totally trusted. 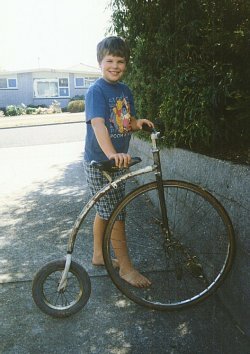 My first idea was to make one that could be removed and put on any bike front wheel. This proved to be much more difficult than at first thought. We ended up with - 2 separate pieces were turned up on the lathe to go each side of the 27" ex bike front wheel where the pedal cranks mount. They had a hole drilled down their centre so both are held in place by a rod passing through the hub, welded to each piece and the hub. 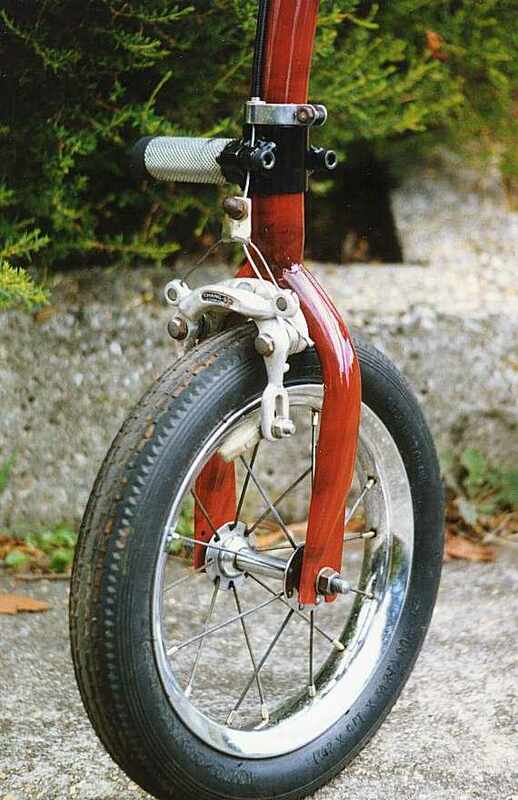 If you don't have access to a lathe I could imagine it would not be too difficult to make it this way using a coaster (pedal back to brake) bike rear wheel and normal bike BB axle. Take out all the hub innards. Make 2 washers, one for each side of the hub that will be welded where the ball races were. These washers will also have the ex bike BB axle through them and welded. 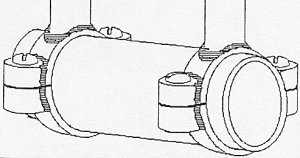 Choose sealed bearing cartridges that fit over the axle. The rest of the design as described above. Of course you could make your own hub. 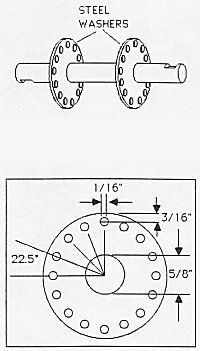 Pattern for drilling steel washers for a 32 spoke rim. A simple subject really except there can be a problem here. I didn't want to grind off the cog on the set of cranks I had but this leaves a problem. When I mounted a (normally) left crank on the right on the Penny Farthing the pedal undoes when in use. 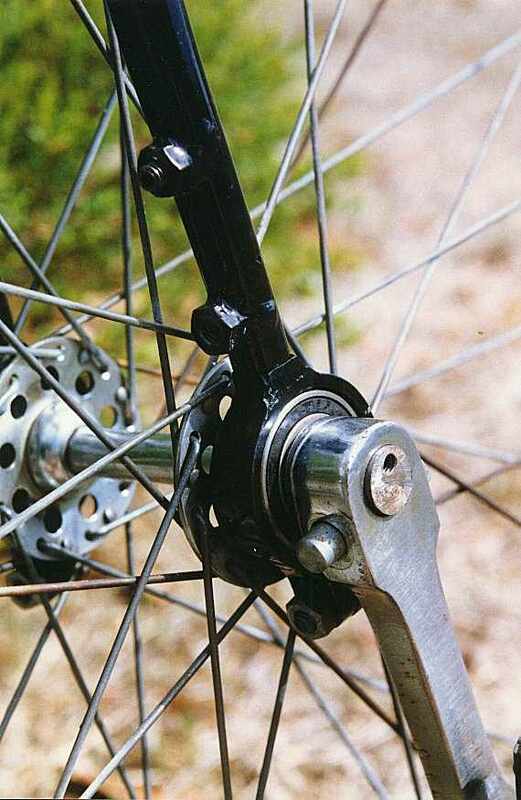 It's interesting to note that the ball bearings must then roll backwards to the rotation of the pedals for this to undo the pedals. (does this make sense) Anyway - I'm trying a glue like locktite to see if that holds the pedal on enough. This was something I though may be difficult to do without kinking the tube but proved to be no problem. Along with a friend we placed a 15" car wheel with a fitted tyre in the vice and cold bent the tube around the tyre. It took some effort and there was waste each side of what's used (to get enough leverage for bending) but that was it. Oh we did draw out the shape onto the floor with chalk to get the right angles. 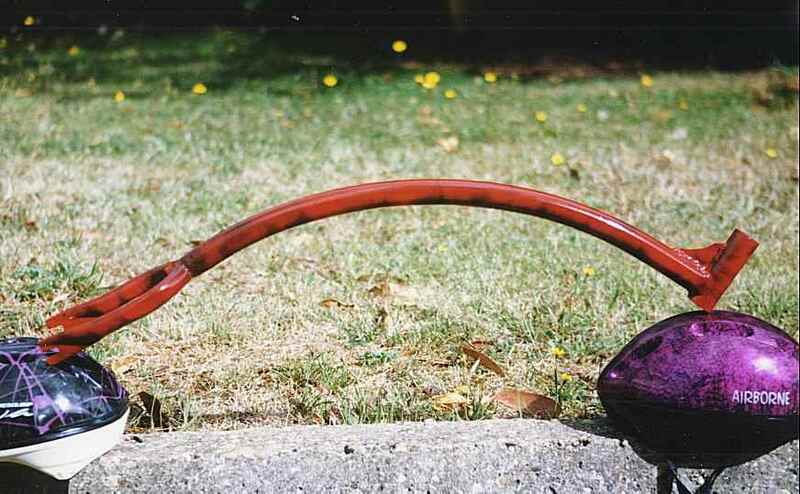 Of course there are much more elegant ways of doing this using pipe benders. The main tube was an old TV areal tube I had around of 31mm Dia x 1.5mm thick. All other parts (except the foot peg mount, seat mount and lathed front axle pieces) are standard bike parts. I'd prefer to have a much thinner rear tyre to match the front but am unable to source one here as yet. Does it need a footpeg? I wasn't sure at first but now that I added it I'm sure it's the best way to get on and off easily. To get going one puts the left foot on the peg and pushes along not unlike riding a scooter. (5 sec MPG video Viewing size 320 x 200, 410k) After a few kicks you swing up and onto the seat whilst timing so you can put your feet on the pedal and push away. It has quite quick steering, probably because the front forks were bent straight which reduced the trail but my son doesn't find it difficult to ride. From new it took him a little time to get on smoothly and because it tips over forwards easily it took a few mishaps to learn to lean back on large bumps but other than that all has been fairly painless up till now. It certainly attracts interest so don't build one if you don't want the rider to be noticed. Is it an easy step before riding a uni-cycle? 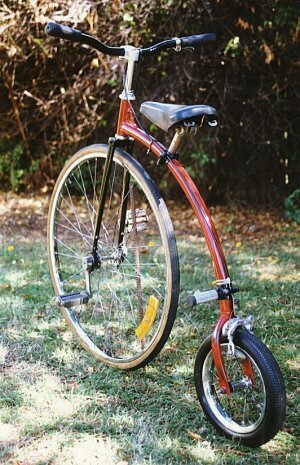 If there is a tandem Penny Farthing around. Just about the right size. In testing the tack welds broke and Chris was dumped on the ground. Believe me he wasn't smiling till I took the picture. 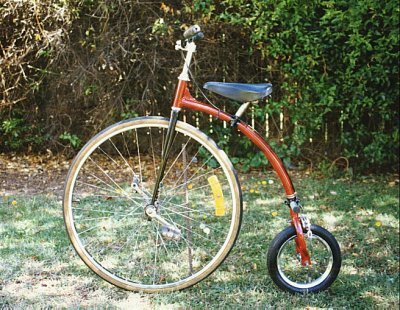 Note the first small rear wheel used. So who else is doing this? Over the years I've come across a few others. If you can identify the source please let me know so I can acknowledge them. 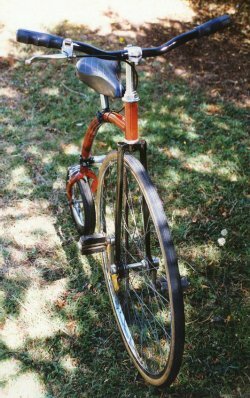 Also check out a nice Mini-HiWheel from Rideable Bicycle Replica's, Inc.
Bicycles & Tricycles: an elementary treatise on their design and construction by Archibald Sharp is a great place to start. 1862-1934, Cambridge, Mass : MIT Press.